Keywords: Influenza outbreaks, Arctic Policy, China-Vatican relation, facial-recognition glasses, environmental justice, M503 route. 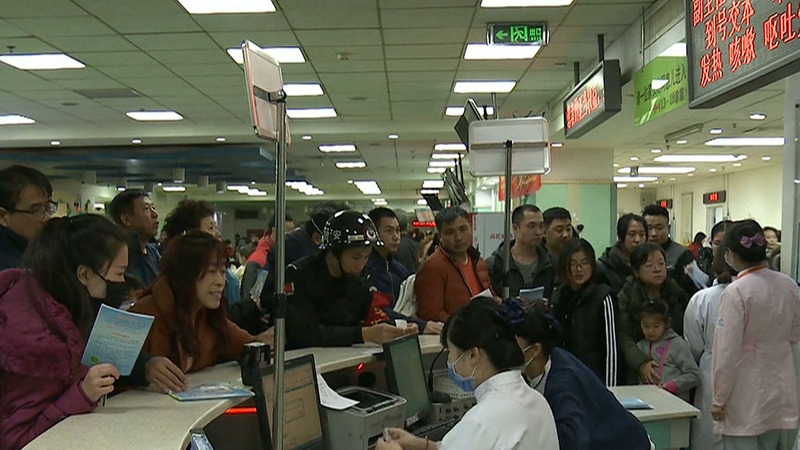 According to China’s health authorities, there has accumulated more influenza cases this winter than any other previous years. Paediatrics departments across the country are overwhelmed with the high number of patients and some were even forced to close due to the shortage of doctors. To make the situation worse, the epidemic in China is more severe than ever before due to cross-infection and the prevalence of certain virus types. According to the Chinese Centre for Disease Control and Prevention, this year’s influenza is a mixture of type A viruses, such as H1N1, H3N2, and the type B virus Yamagata which “has caused a lack of immunity against the strain and made many people vulnerable” (Straits Times, 10 Jan 2018). Although type B Yamagata is nothing new, it is the first time that it has affected the country on such a large scale. Given that no mutation of viruses is found, while vaccination could effectively prevent infection, the vaccination rate is low in China, with only 2% of the population having been vaccinated. And despite the government has supplied 26 million vaccinations to the public this year, there are six million left after the vaccination period. According to the medical authorities in Binhai County, Jiangsu, the low vaccination rate among children is the result of parents’ lack of understanding of vaccination and concerns over its potential negative effects. And surprisingly, according to the same source, children of rural household hukou are more likely to be vaccinated than their urban counterparts, because their parents – likely to be low-income and low-educated – are more willing to listen to doctors’ advice. According to foreign news sources such as Radio Free Asia and CNN, there are currently around 120,000 Uyghur Muslims detained in Kashgar prefecture of the Xinjiang Uyghur Autonomous Region. Human rights advocates have suggested that detainees are require undergoing a re-education process such as learning Mandarin, singing revolutionary songs, praising the Communist Party, and studying the thoughts of President Xi Jinping. Maya Wang, a researcher for Human Rights Watch, has stated in a report published last year that the government does not set any time limits on the length of detention or provide any legal documents to the families of detainees. As fear permeated throughout the Uyghur community, Omer Kanat, chairman of the World Uyghur Congress, said, “In some villages, you can’t see men on the streets anymore — only women and children — all the men have been sent to the camps.” (CNN, 3 February 2018). Since the regional government has been led by Chen Quanguo, a Xi loyalist who was formerly the Communist Party Secretary of the Tibet Autonomous Region, there appeared an intensifying crackdown against Uyghur Muslims who are perceived by the government as Islamic extremists, such as DNA collection, ubiquitous installation of surveillance cameras, the banning of long beards, veils, and home-schooling in 2017. On 26 January, China, for the first time, released a white paper on the Arctic, entitled China’s Arctic Policy (中国的北极政策). Claiming itself to be “an important stakeholder in Arctic affairs” and a “Near-Arctic State”, the Policy specifies that China seeks to expand the Belt and Road initiative by linking with other Arctic states through the “Polar Silk Road”. Calling for the promotion of maritime safety, stability, and commercial activity, the Policy has outlined four aspects of China’s role in the Arctic affairs. First, developing maritime shipping routes involving Canada, Russia, and countries in Northern Europe. Second, exploring natural resources as well as strengthening sustainable energy (e.g. wind and geothermal power) cooperation with other Arctic states. Third, utilizing fisheries and developing seafood industries. Fourth, developing Arctic tourism. Pledging to work with intergovernmental organizations such as the UN Convention on the Law of the Sea (UNCLOS) since the country became an observer member of the Arctic Council in 2013, critics suggest that the Policy reflects China’s growing interest in “seeking a more comprehensive approach to engaging the region beyond scientific diplomacy” (The Diplomat, 29 January 2018). Having met at least four times since 2016, Chinese and Vatican officials, according to media reports, seem to be reaching an agreement over the appointment of bishops in China where around 12 million Catholics reside. First broke ties with the Holy See in 1951, despite religious practices have been tolerated since the 1980s, Chinese Catholics nowadays can nevertheless only choose between state-sanctioned churches – accepted by China’s Catholic Patriotic Association (CPA) but not recognized by Vatican’s authority – or underground congregations. Under the new agreement that is “ready and could be signed in a few months” (Reuters, 2 February 2018), Vatican would appoint bishops chosen by, as well as legitimize the bishops who are currently appointed by, the Chinese government. While some saw the agreement as a historic breakthrough in China-Vatican diplomatic relation, many have been critical of the decision. Having previously discussed with Pope Francis over China’s suppression of religious freedom (SCMP, 5 February 2018), Cardinal Joseph Zen Ze-kiun of Hong Kong, a retired bishop who has been a pro-democracy activist outspoken on political freedom and human rights, has accused Vatican of selling out to Beijing. Marking the 40th anniversary of China’s economic reform, as President Xi Jinping said in his 2018 New Year’s speech that the opening-up policy was the only way to realize the Chinese Dream, journalists and scholars have started to reflect on the transformation in the countries’ industries since 1978. According to Li Peilin, a professor of sociologist at the Chinese Academy of Social Sciences, the composition of China’s working population has undergone major changes in the last 40 years. Compared to 1978 when 790 million out of the 960 million people worked as agricultural workers, the number of service workers (330 million) has now exceeded both the manual (220 million) and agricultural workers (282 million), constituting 43% of China’s working population. And the number of professional and skilled workforce has raised from 15 million in 1978 to 50 million in the present. Moreover, there observed a significant fall in the number of state-owned and collective-owned enterprises (75% and 25% of the total economic entities in 1978) to only 30 million and 4 million workers respectively in 2015. Stationed in a railway station in Zhengzhou, Henan, police officers are the first in the country to use glasses with facial-recognition software – resembling Google Glass – to identify criminals during the Chinese New Year travel season. After scanning the faces of passengers, the glasses are then linked to a database of suspects though a software on mobile devices. As of 6 February, there were already seven hit-and-run and human trafficking fugitives as well as 26 cases of identity fraud identified. The glasses mark another milestone of China’s ambition in the AI industry and increasing level of collaboration with tech companies, since the implementation of facial-recognition technologies for criminal investigation in Shanghai and Qingdao in recent years. According to a South China Morning Post article published in October 2017, China is in the process of developing a database that stores the information of its 1.3 billion citizens that is able to identify any individuals in three seconds. By analysing the data from all 412 district council constituencies across Hong Kong, a recent study published in the journal Environmental Science and Policy has provided new quantitative evidence of the city’s environmental injustice. According to Professor Victor Li On-kwok – one of the authors and director of the Hong Kong University-University of Cambridge Clean Energy and Environment Research Platform, the findings has confirmed a statistically significant correlation “between average concentrations of fine suspended particulate matter, or PM2.5, and a social deprivation index” (SCMP, 30 January 2018). The index is derived from the variables configured by the Census and Statistics Department including low education, low income, non-home ownership, non-professional occupation. While the World Health Organisation has set the safe limit for average PM2.5 concentrations to 25 micrograms per cubic metre, districts ranked high in social deprivation such as Kwun Tong, Wong Tai Sin, Sham Shui Po, and Yuen Long have recorded averaged PM2.5 concentrations from 68 to 84 micrograms. Referencing the study, the Clean Air Network, a non-governmental organization that focuses on the issue of air pollution in Hong Kong, has urged the government to tackle traffic congestion which is considered the primary source of air pollution in the city. China’s recent launch of new flights on the M503 route, which lies merely 7.4 kilometers from the air border between Taiwan and mainland China, has been met with protests by the Taiwanese government. Claiming that the route would help ease air traffic congestion, China did not conduct any prior consultation with Taiwan as the Chinese government’s Taiwanese Affairs Bureau said that the route is limited to Chinese airspace and, hence, no agreement is necessary. Setting out to protect its air-defense identification zone, Taiwan has consequently refused to approve the additional 176 cross-strait flights operated by China Eastern and XiamenAir for the Lunar New Year holiday, affecting 30,000 China-based Taiwanese who plan to return home. The Department of Navigation and Aviation under Taiwan’s Ministry of Transportation and Communications has confirmed that, if required, military aircrafts will be used to send Taiwanese home from Kinmen. According to a survey released by the Taiwan-based Cross-Strait Policy Association, “74.2 percent of respondents disapproved of mainland China’s unilateral launch of the flight routes, while 85.7 percent supported the government’s call for Beijing to commence talks so as to resolve the matter” (Taiwan Today, 1 February 2018), reflecting Taiwan citizens’ hope that the dispute can be resolved through communication.